Being Retro: Happy Friday! Look it's My new dog IZZY! 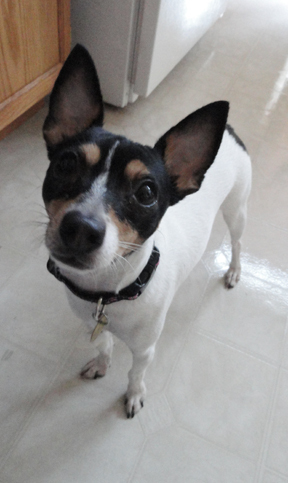 We got a rat-terrier last weekend from my wife's parents, she is a year old and had been abused from a third party... you know the type. Want a dog, but don't want the responsibilities. So now we have her and she is a so far a good dog, with some need for some love. So I am working on making her feel welcome, so it's like having kids with the dog and the two cats. It's a zoo! Grats on your new addition! That's a very noble thing you have done. I rescued my old cranky grey cat some 10 years ago and he has been nothing but great. How cute!!!!!!!!!!!!! I love any Terriers, I have a Jack Russell myself. She's a cutie! Oh and I love retro-iZombie! it's fun and bright! Makes me mad when people get a pet and then don't take care of it. hey now! I am liking the new background! simple yet very cool! thanks all, i am happy she is part of my world... and glad you like the new look, i am trying to make things more simple. my brain exploded and my creative side was a causality of the blast.